Stuart has had a lifelong passion and love for the mountains and outdoors. Early backpacking trips with family and friends quickly progressed to mountaineering throughout Britain often in full on Scottish winter conditions. Following university, where Stuart studied Geography, he spent four months trekking and climbing in the Nepal Himalaya. On return Stuart served as a Paratrooper with the British Army and much of this time was spent on Britain’s higher ground in less than ideal conditions. 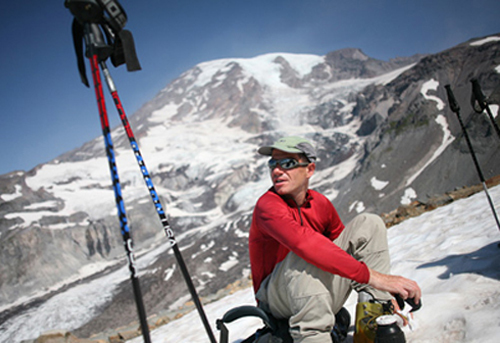 In the past ten years Stuart has had the privilege of climbing rock, ice and alpine routes throughout the diverse State of Washington. People who have been on trips with him have remarked on his calmness under pressure, strong leadership skills, wry Scottish humor and his genuine enthusiasm for seeing his clients realize their goals. When not climbing he enjoys running, private flying and spending time with his wife, Amy, and sons Kai and Ewan at their home in Seattle. Most recently Stuart led our successful Mexico Volcanoes trip.